The Life and Adventures of Santa Claus is a 1902 children's book, written by L. Frank Baum and illustrated by Mary Cowles Clark. Claus, as a baby, is found in the Forest of Burzee by Ak, the Master Woodsman of the World and adopted by the Wood Nymph, Necile. 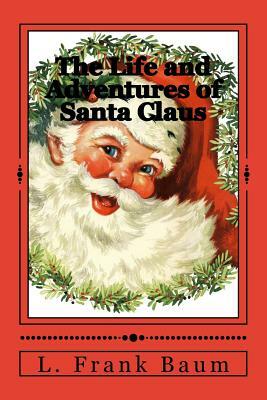 It is an excellent introduction to Santa Claus since it begins with him as a baby and follows him through adulthood. As an adult, Claus settles in the Laughing Valley where he begins carving toys. Seeing that most children are good, Claus borrows two reindeer and begins delivering tows to the children. He finds that he can deliver the toys faster if he slides down chimneys and puts them under Christmas trees or in stockings hung by the chimney. Before long, Santa Claus gets help from faires, elves, and even parents and toy-making companies to get enough toys for all the children in the world. L. Frank Baum was an American author chiefly known for his children's books, particularly The Wonderful Wizard of Oz. He wrote thirteen novel sequels, nine other fantasy novels, and a host of other works (55 novels in total, plus four "lost works," 83 short stories, over 200 poems, an unknown number of scripts, and many miscellaneous writings), and made numerous attempts to bring his works to the stage and screen. His works anticipated such century-later commonplaces as television, augmented reality, laptop computers (The Master Key), wireless telephones (Tik-Tok of Oz), women in high risk, action-heavy occupations (Mary Louise in the Country), and the ubiquity of advertising on clothing (Aunt Jane's Nieces at Work).